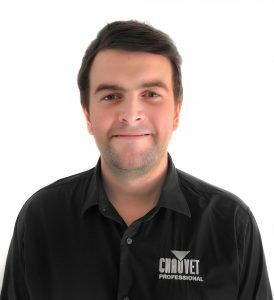 NOTTINGHAM, UK – Ben Virgo has joined Chauvet as European Senior Product Specialist for the company’s CHAUVET Professional lighting products. A ten-year veteran of the lighting industry, Virgo brings an extensive technological background to his new position, having previously served as Head of Technology at Factory Settings Ltd., where he was tasked with integrating technology into large-scale production projects. Prior to assuming that position, he was the European Technical Manager at ENTTEC lighting controls.